Home › Information & Resources › ReactorPanel Saddle Information: Tell Me More… › Why Try a ReactorPanel ® Saddle. Why Try a ReactorPanel ® Saddle. Once your ReactorPanel© saddle is correctly fitted you should feel close, deep and connected to your horse. The saddle also has superior stability, the panels moving independently with each side of the horse producing a “massaging” effect which encourages the horse to lift its back and work in a natural outline. During the 4 week trial we give you the following changes are often observed, sometimes at the initial fitting. However some horses need a little bit of time to adjust to the new feeling. 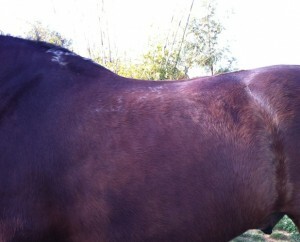 The horse will be feel and be visibly more relaxed . 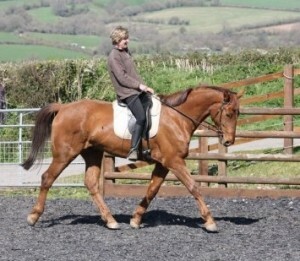 The rider will feel closer and more in tune with the horse and able to feel every footfall. Nervous riders often become confident again due to the stability of the saddle and more relaxed horse. Stride length increases and the horse will often be able to work more consistently on both reins. Offering a more balanced and collected canter picking up the correct lead more often. Horses who previously exhibited a problem being ridden downhill are freer . The saddle encourages the horse to work from the behind in a natural outline, the massaging action of the panels encouraging the back to lift. Hence a more extravagant movement can be achieved. You may need four weeks to get used to riding it! Superior recovery for wasted muscle, in the case of wastage behind the scapula the panels skims the wasted muscle unlike traditional or treeless saddles which will often “sit in ” behind the scapula. Increased athletic performance and overall muscling as the horse uses himself in a more efficient way if combined with correct training. Transitions are more timely as the horse can feel your aids more easily, the close contact feel of the saddle allows the rider to give aids at the correct time. Our Endurance customers report that their horses, when being ridden at high levels of competition experience lower heart rate and increased stamina when being ridden in our saddle. A dramatic reduction or elimination of back pain, verified by equine body workers and chiropractors in horse and rider where the saddle is correctly set up. Reduction of “Girthiness” in horses who were previously unhappy to be saddled in most cases complete disappears over time. Mango 6 months later, after fitting with a ReactorPanel Saddle, the right nutrition, work and massage he is recovering nicely. These saddles however are not a “magic fix all”, the use of them, particularly for remedial horses and ponies should be combined with an appropriate training regime, the advice of professional body workers and or the vet , correct shoeing or trimming and dental attention when required. For some ponies our traditional Pony range are a more appropriate choice but we have found that most horses benefit from its use. 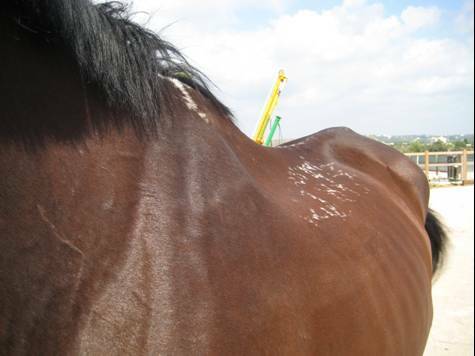 While testing, you may need to pay close attention to your horse, because changes in behavior and way of going are not always dramatic or instant. usually a difference, sometimes pronounced can be seen within the four week trial. Saddle Exchange Saddling Solutions offers a wide range of English saddles, both in single and Mono-Flap versions, a Western, a Iberian saddle and a saddle designed for riders of Icelandic Horses. We are also happy to design specific saddles for individual rider needs, this is how some of our most popular designs came about, providing a custom fit to you and your horse’s needs. Use the 4 week trial to decide whether the saddle you are trialing fulfills all your needs or whether you need something specific other than the standard model. We are always happy to revisit, usually free of charge to make sure you get the perfect saddle for you and your horse. Here’s a video of Mango for a saddle fit, filmed at the time of the second picture. There are more videos on our YouTube Channel, Saddle Exchange TV, Reactorpanel playlist.